“Before the process of denuclearisation can be final, we must have a complete understanding of the full extent of the North Korean WMD and missile programmes through a comprehensive declaration,” Biegun said. 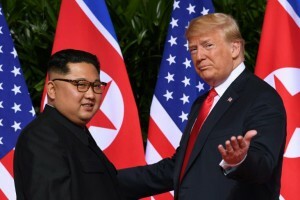 Rejecting criticism that the Singapore declaration was vague, Biegun said that Kim has committedboth at the summit and in follow-up talks with Secretary of State Mike Pompeoto “the dismantlement and destruction” of all plutonium and uranium sites, not only its signature Yongbyon facility. Biegun said Trump was prepared to assist Kim in building “a brighter economic future” and gave nuance to the repeated US insistence that it will not ease sanctions until denuclearisation. “We say we will not lift sanctions until denuclearisation is complete. That is correct. We didn’t say we won’t do anything until you do everything,” he said. Biegun assured North Korea that Trumpwho in 2017 threatened in front of the United Nations to “totally destroy” the countrywanted to end the state of war. “We are not involved in any diplomatic discussionfull stopthat would suggest this tradeoff. It has never been discussed,” Biegun said.